My Granny sets her table for every meal. Nothing extravagant, just plates, silverware, napkins, glasses, and serving dishes. Eating at her house, whether breakfast, lunch or dinner is an event, not a rushed interference to the rest of their busy day, but an event worthy of a well-set table. In her day, that was a normal routine and to this day, to not put the food in serving dishes makes her feel a little wild or lazy, I'm not sure which. Today, many families are lucky if they can pull themselves away from the TV to get to the dinner table, let alone use serving dishes and proper place settings. 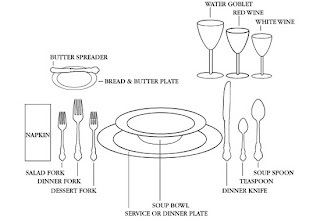 I admit, although I have sat through several "dinner etiquette" classes, I still have trouble remembering which side the forks go on, and my husband cannot understand for the life of him why I would ever consider making more work for myself by transferring our food from pots and pans to serving dishes. This week's making mealtimes matter challenge is to set your dinner table, and your lunch table, and your breakfast table, as often as you can. Pull out your serving dishes (or use plates and bowls) and get your food out of the pans and onto the table. For my fellow homemakers who, like me, may have trouble remembering the proper way, here is a quick how-to on setting your table. 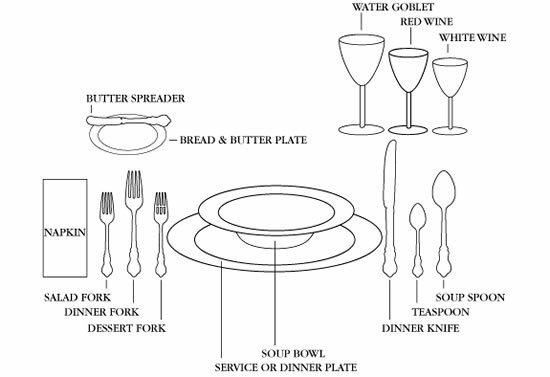 On the left hand side of the plate go the salad fork and dinner fork. To the right, the knife, sharp end toward the plate, then spoon. Napkin should go on the plate or under or to the left the forks. I have found that setting my table properly really does help me to slow down and enjoy mealtimes with my family. My children love using the "good" plates like mommy, and our mealtimes really do feel more important. My husband doesn't understand why I transfer the food either (and I've gotten to the point that with some pots, I don't); and if I ask him to set the table, he always asks what silverware we need--no need to dirty knives to serve spaghetti. If I set the table with unneeded flatware, he asks why.